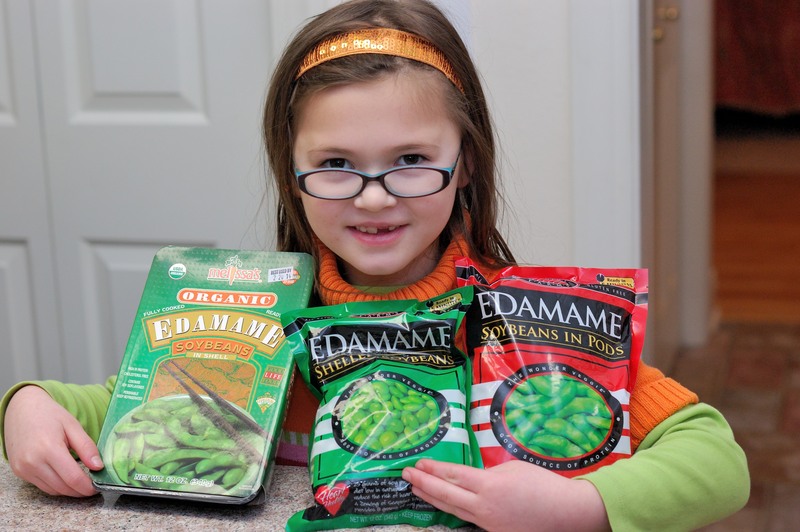 On our last few grocery shopping trips, Lucie has spotted the edamame and expressed her desire to try them soon. So that is what she picked for our vegetable this week. Edamame, a type of immature soybean, is also known as a vegetable soybean or edamame bean. 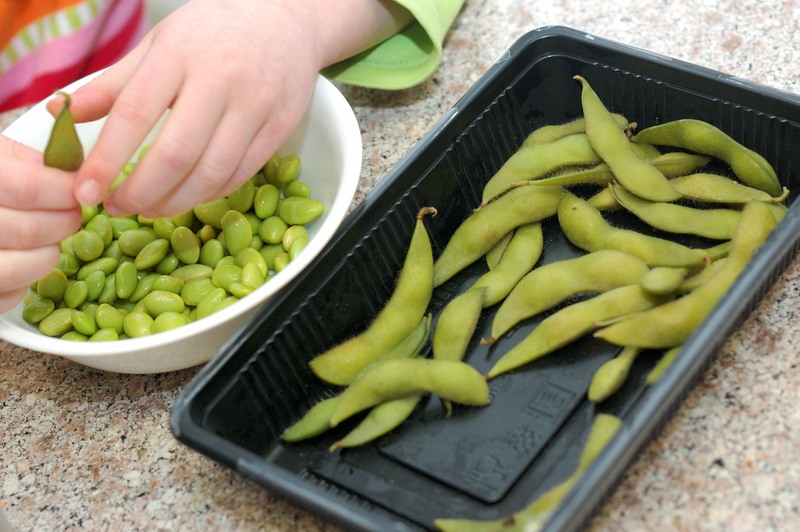 You can read more about edamame at the National Soybean Research Lab’s website. Dave went to Hy-Vee and brought home every kind of edamame he could find for us to try. 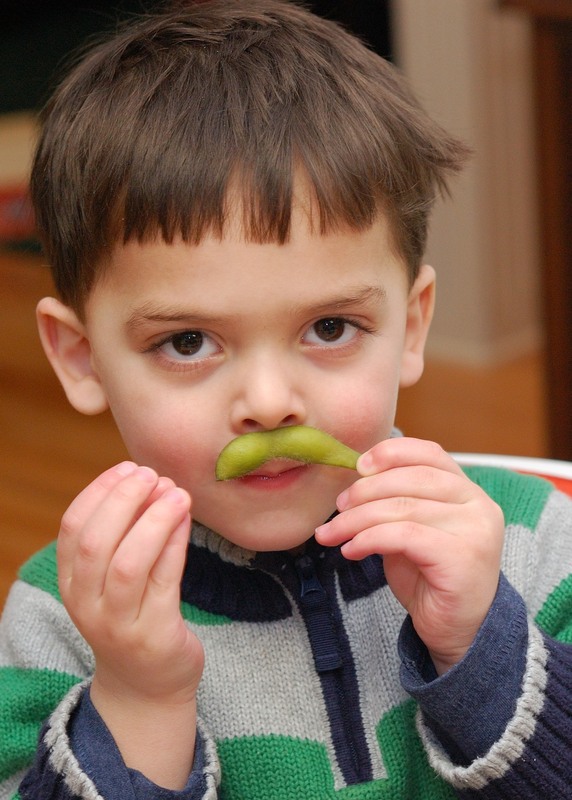 He found fully cooked edameme in pods, frozen edamame in pods and frozen shelled edamame. I have only tried edamame as a part of a Kashi frozen entree. While I have enjoyed eating the Kashi® Steam Meals™ Sesame Chicken, I was a little nervous about preparing edamame on my own. (By the way, this is an excellent dairy-free option for those days when you are too tired to cook. Theo loves it.) I planned to try preparing our first edamame meal with a similar idea and chose Gingery Beef Stir Fry from A Full Measure of Happiness. While I was preparing the ingredients, a whole herd of rowdy children came to the kitchen to see what was going on. They insisted on trying the edamame right away, so we followed the directions from the package of the fully cooked edamame in pods. We microwaved them for 30 seconds and sprinkled them with sea salt. Lucie was excited to try them. Theo practically crawled across the counter to get to them. Sadly, they were not a success. 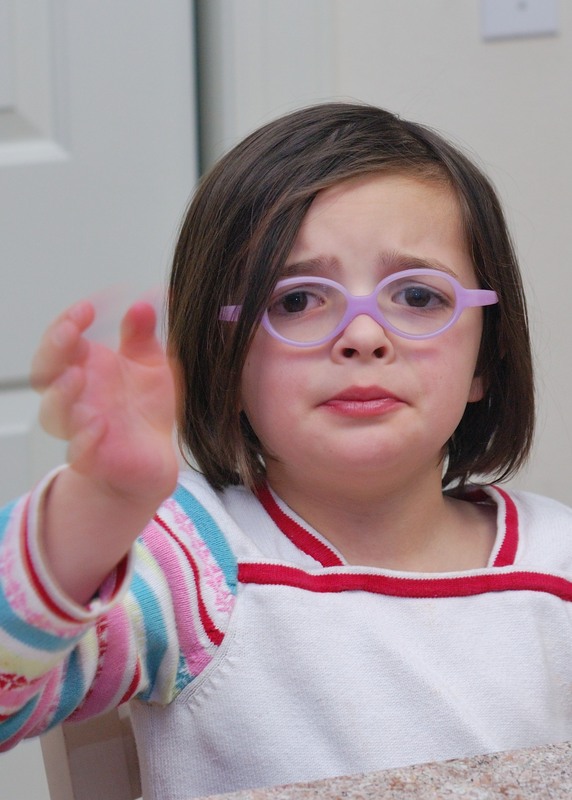 Josie acted like she was going to die from edamame poisoning. 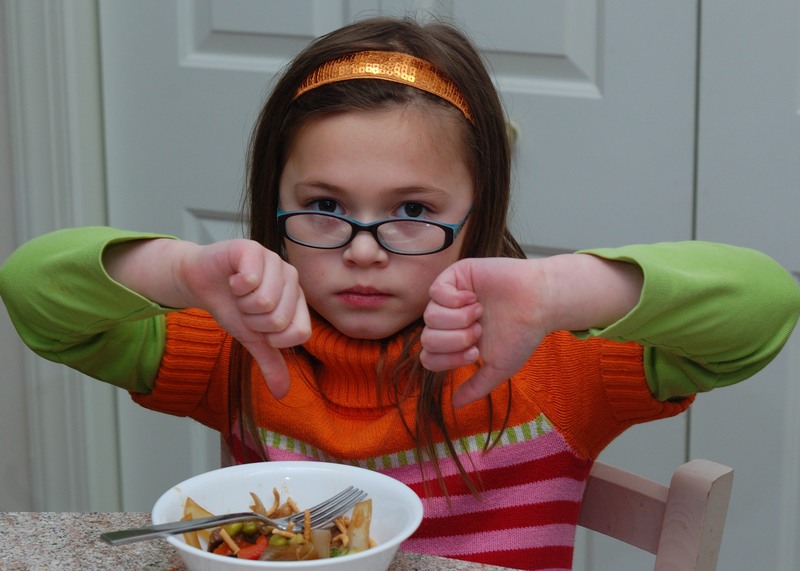 Theo gave the edamame two thumbs down. His sisters agreed with him completely. 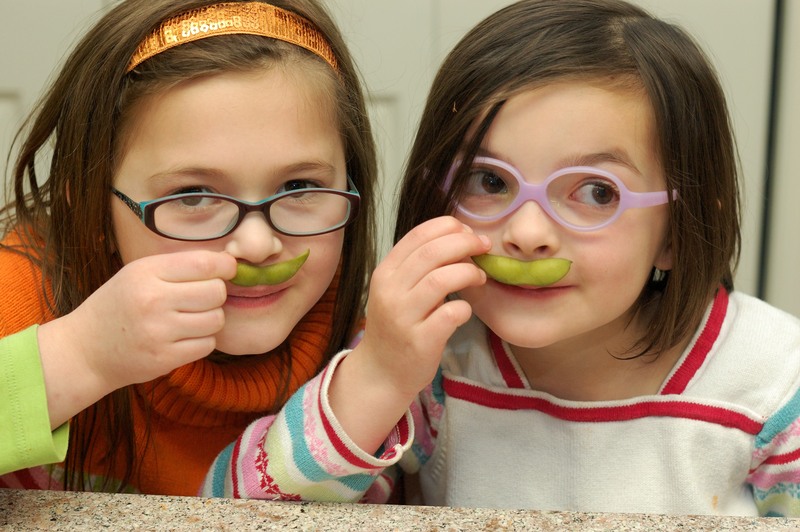 Fortunately, the girls found a way to make the best of the edamame. Theo had to join in. 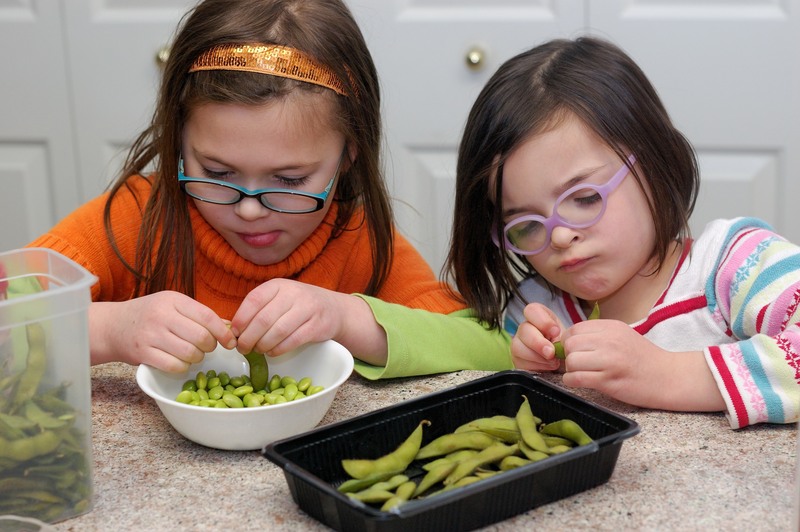 They also found that shelling edamame for our supper recipe looked like fun. The girls were very efficient and soon had the whole tray shelled. While they worked, I prepared the other veggies that we would need. 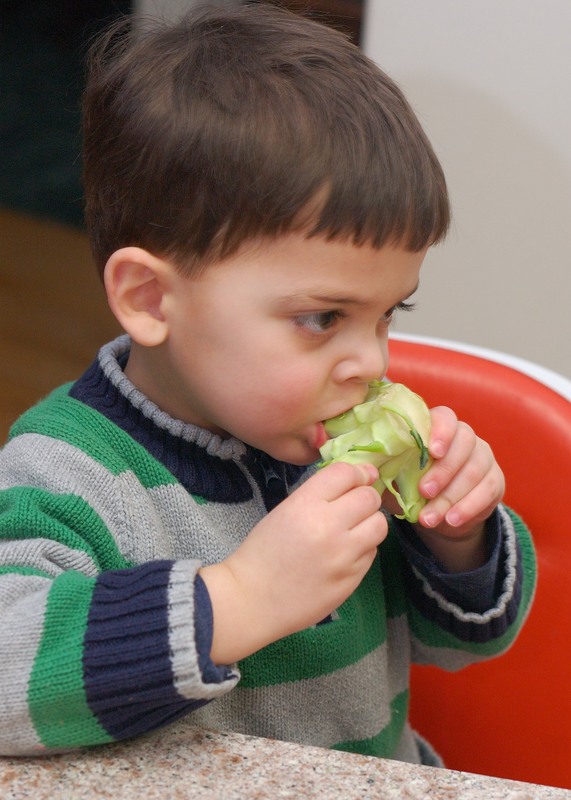 Theo wondered about the broccoli stem that I removed and decided to make it into a snack. 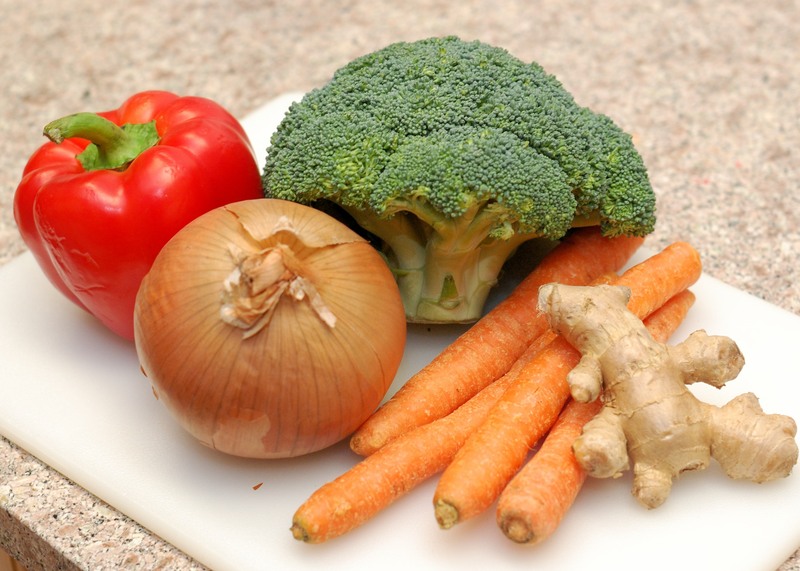 He also sampled some raw broccoli florets, some raw carrots (claiming to be a bunny rabbit) and a few red peppers. 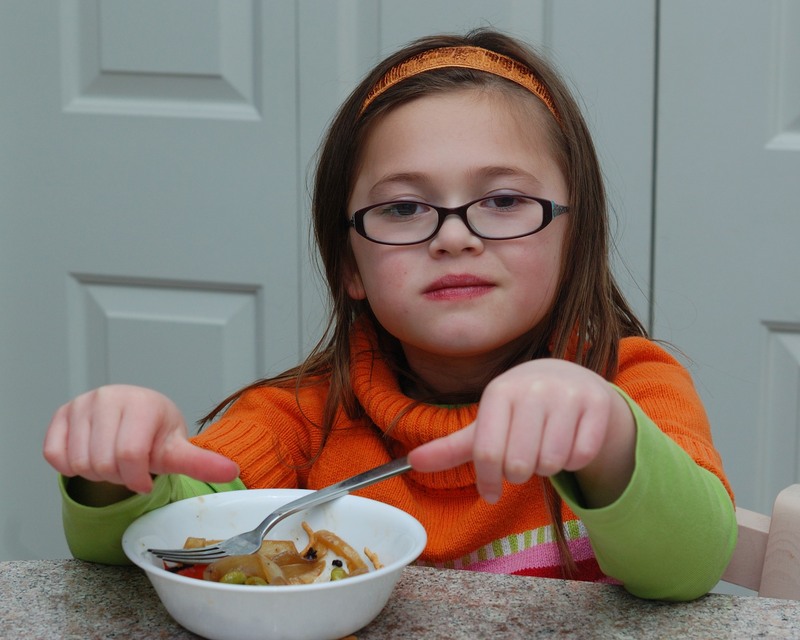 Meal preparation time is a great way to get kids interested in eating veggies. I think they are more likely to try a few bites of something new when they are hungry and waiting for their meal. 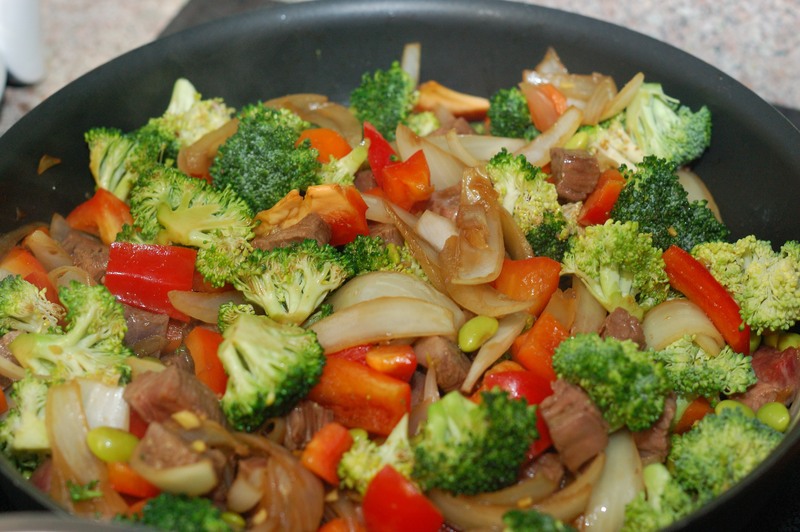 We prepared the Gingery Beef Stir Fry according to the recipe. It looked and smelled very tasty. We served it over black rice, as the recipe suggested. 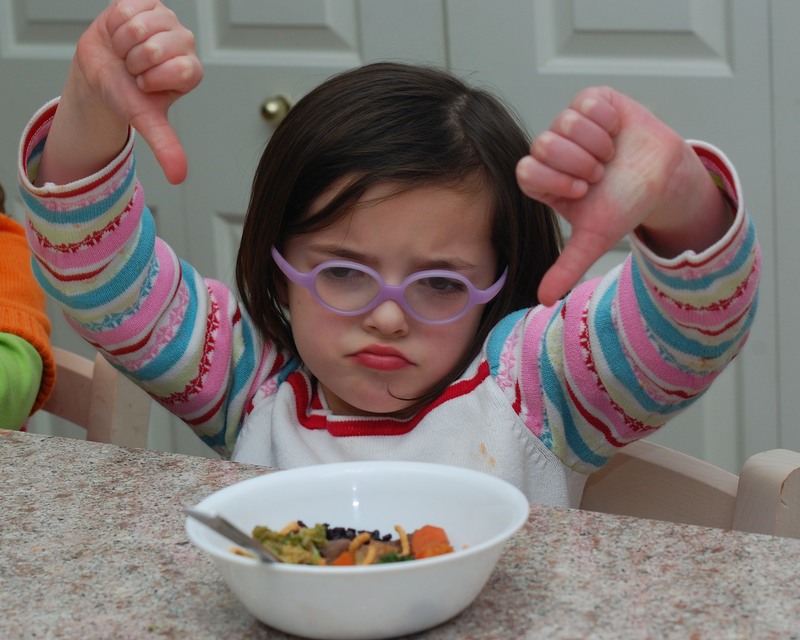 I wasn’t sure if the kids would be willing to try it, since they had just rejected edamame, but they were all willing to try again. We were hoping the soy sauce and honey made an improvement in its flavor. Nope. No improvement for Theo. 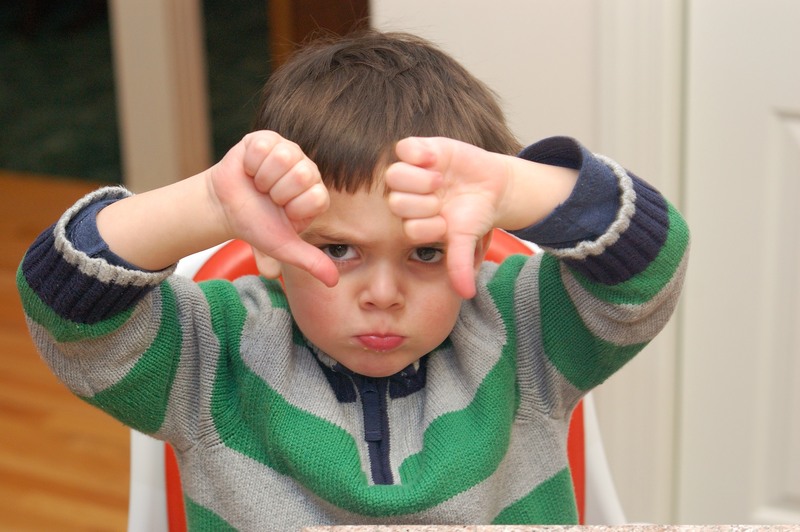 As I suspected, two thumbs down from Joz. Same verdict from Lucie. These ratings were based on a bite consisting only of edamame. 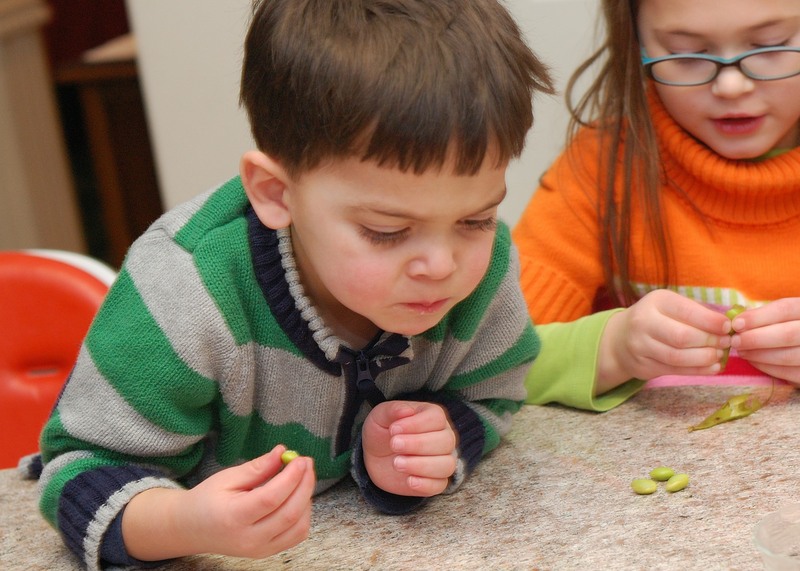 Since the kids all like beef, rice, broccoli and usually red bell peppers, I urged them to try eating around the edamame. They did and said that they liked the rest of the food. Chow mein noodles sprinkled on top of everything made it even more appealing. 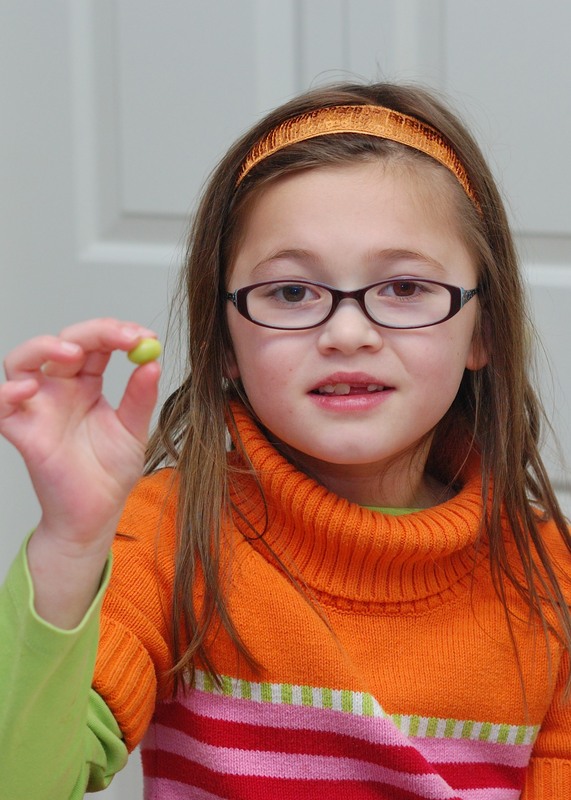 After a while, I asked Lucie if she thought that the edamame would taste a little better if she ate it with a piece of broccoli or beef. She though it might and gave it a try. She decided to upgrade her rating to two thumbs to the side. I was shocked when Josie did the same. Dave and I both though this recipe was very good. We would both eat it again. I do agree with the kids. I did not really like the edamame by itself, but I thought it tasted fine when eaten as part of this recipe. Dave thought the edamame on its own was great. 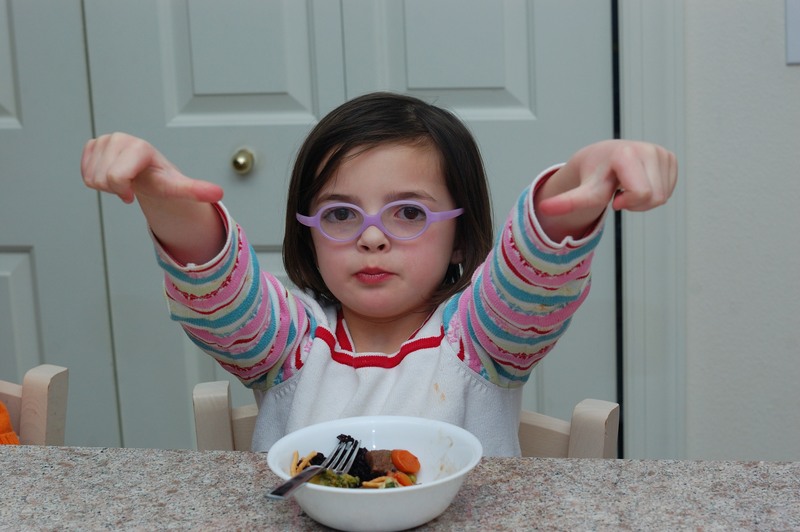 I think distracting kids with edamame was a great way to get them to eat broccoli, onion, red bell pepper and carrots. 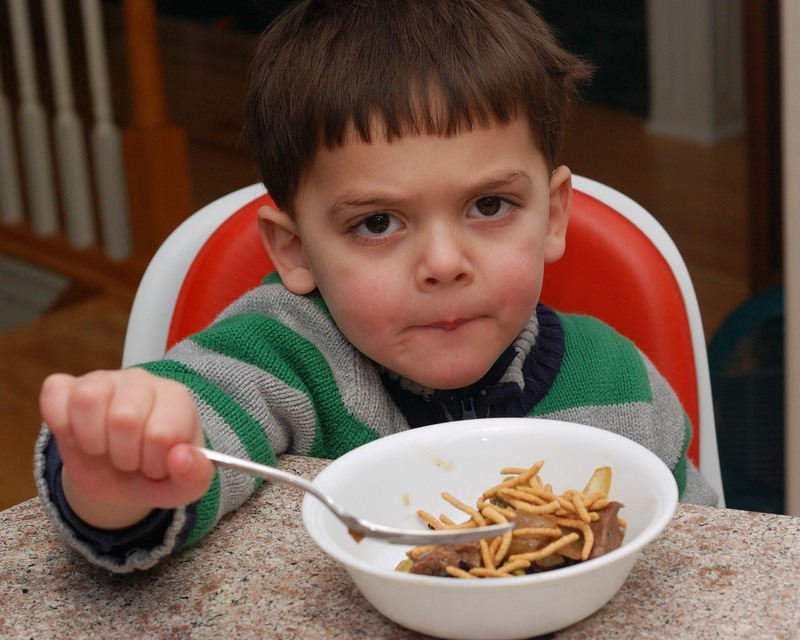 I was kind of surprised that I did not like edamame. I did not like the way it felt in my mouth and I thought it tasted bizarre. It wasn’t as bad if you ate it with other food. 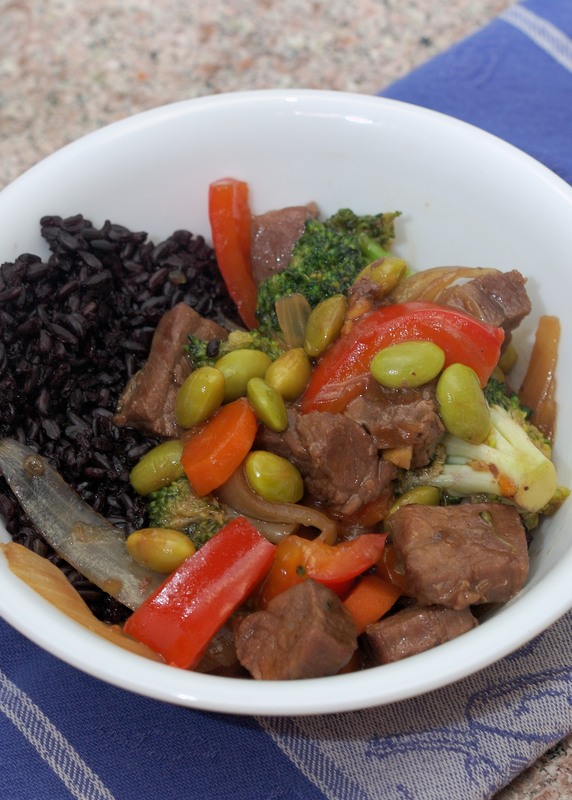 Categories: Edamame | Tags: beef, black rice, broccoli, carrot, dairy free, edamame, ginger, onion | Permalink.